This is the work of Jessica-Tayler Cain, a UK based, 20 year old artist. Her colorful and large installation work takes on a bigger meaning through the color pink and when framed through consumerism. Her materials, though varied, are at first charming, and upon further reflection, a bit alarming. Condoms, alien boys, and a giant heap of pink goop are just a few with an out-of-this-world feel. Read Jessica-Tayler Cain's artist statement below for a better understanding of the work and artist herself. I create work to expose the truth behind the everyday gruel we get force-fed by higher powers. Using playful, tactile materials, I create immersive works to provoke a visceral reaction. The use of garish colour and sensory materials draw in the viewer with a sense of childlike wonder only to be then repulsed by the underlying theme. Process and transformation is an important aspect to my practice, focusing on natural and artificial manipulation to explore the reactions between materials and evoke multiple sensory aspects. By pouring different liquids and mediums to create texture, my pieces become almost living, breathing masses of gloopy destruction. I use the methods and processes to make meaning in a world that revolves around meaningless consumption. With a huge interest in consumerism, the work I make actively engages with the world around me, and reflects what I take from the media. Battling with thoughts around culture and industry, there is a certain aspect of tension in my work. The idea of control, or lack of, plays a huge part by representing our own personal emotions towards consumer culture and capitalism. The work I create is very excessive and sickly sweet, to show the constant overproduction that we are bombarded with on a daily basis, manipulating mass society into passivity. With an interest in themes of childhood and adolescence, I enjoy making fun and expressive work that tackles growth within a consumer culture. Through research into Freud’s ‘Uncanny’, I became aware of the importance of social taboo and how this corresponds with the work I produce, particularly thinking about the relationship between Heimlich and Unheimlich and their different translations. In regards to what is classed as Heimlich (private), thoughts concerning etiquette allows an understanding of what is typically Unheimlich (eerie). With this in mind, accepting that children do not abide by our set of social standards, my work reflects the audacious, carefree and excitable nature of the child. 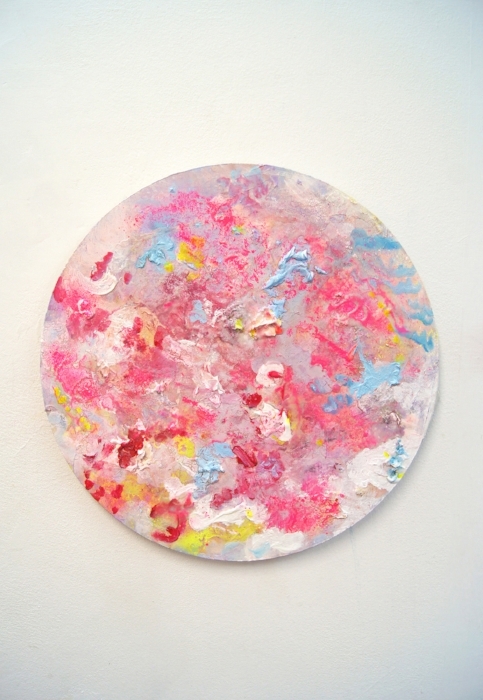 Acrylic paint, spray paint, fluorescent ink and PVA on calico on board. As process was becoming more important to my work, I experimented with different ways of building texture and layers using paint in a more sculptural style to create globular shapes. I laid the piece flat and kept pouring on materials until I was happy with the outcome, so I kept a control of substances used and where they were placed but the eventual appearance changed as the piece moved and settled. I wanted to keep that level of chaos/control between myself and the works I make, essentially allowing the piece to become the monster that it was intended to be. Condoms, balloons, ink, acrylic paint, acrylic plastic, PVA, glitter, glitter glue and sequins. Working with childhood and adolescent sexuality a lot within my work, this piece represented the sexist differences between contraception expectations with teenage females and male, touching on menstruation too. Here I mixed the idea of the 'blob' and the water filled condoms ('Monster Blood') together to make them appear more globular and I figured out the only way to keep the piece sustainable was the make them solid. When I was making the condoms I was thinking about sexualisation of young girls but also the restraint of sexuality in youth. The pieces themselves are soft and smooth, and when you handle each of them they feel quite seductive. The fleshy pillow was intended to be the 'safety blanket', an area of comfort contrasting not only to the hard, industrial materials of the condoms but also to the disconcerting themes running through. Here I created a piece that was supposed to be the epitome of consumerism, as if the idea of it had created this mass of sticky, sickly artificial garbage that alive. To view more of Jessica-Tayler Cain's work and keep up with her constantly evolving practice, like her page on Facebook and follow her on Instagram.